Available in iTunes App Store Wolfgang Palm has brought us so many amazing things over the years. His contribution to the iOS music scene may not be prolific, but it has been consistently outstanding. 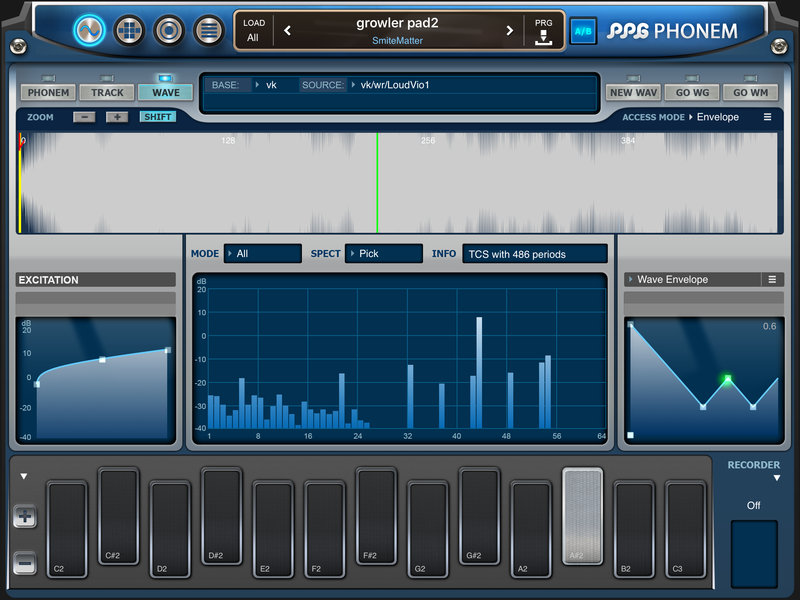 PPG Wave Generator and WaveMapper have both become staples in many artists mobile synthesizer arsenals. 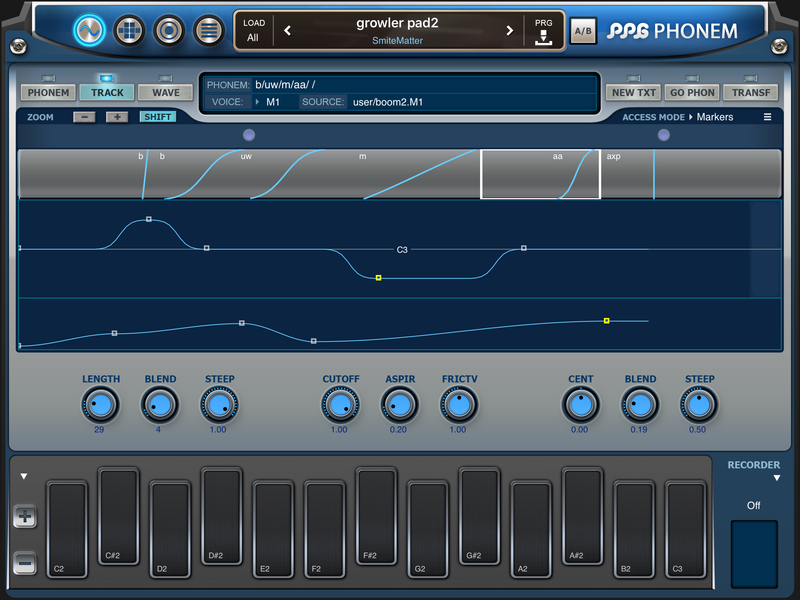 Now the powerful, vocal synthesizer, VST/AU desktop plug in Phonem has come to our devices. The App Store descriptions says ‘optimized to work pretty well on iPads’, but that’s just being modest. In my opinion it works very well, and is quite strong. 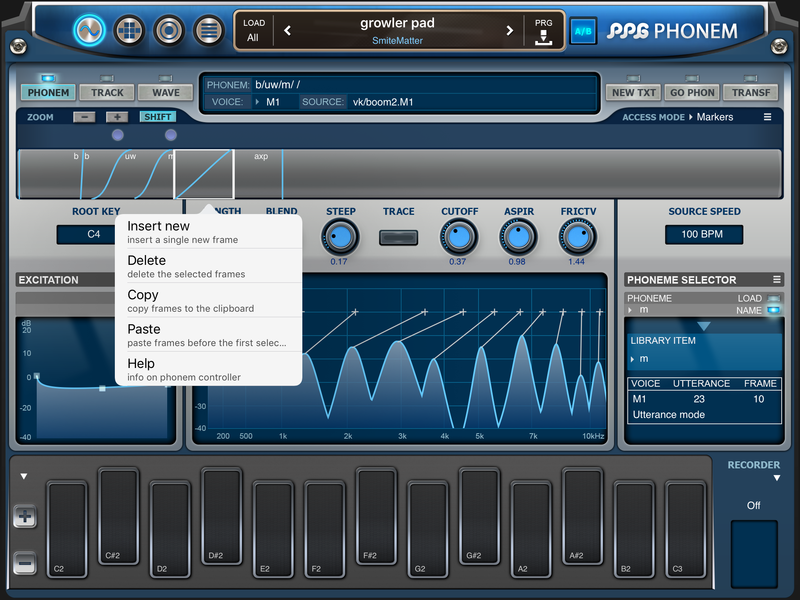 Originally designed to be a vocal synth, Phonem is not limited to just its initial intentions. It is a powerful synth with a huge array of parameters with infinite combination possibilities for modulating and routing. 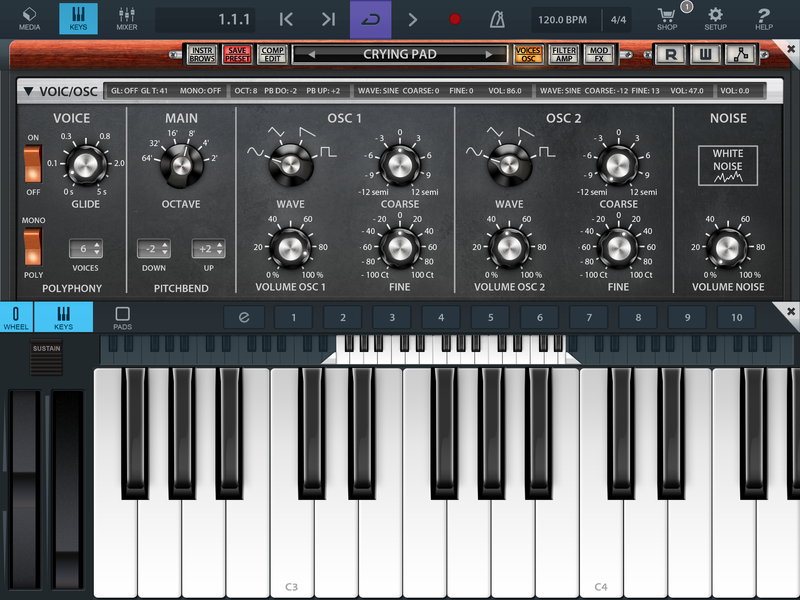 The engine proves to be highly competent and capable of a wide scope of synth sounds. 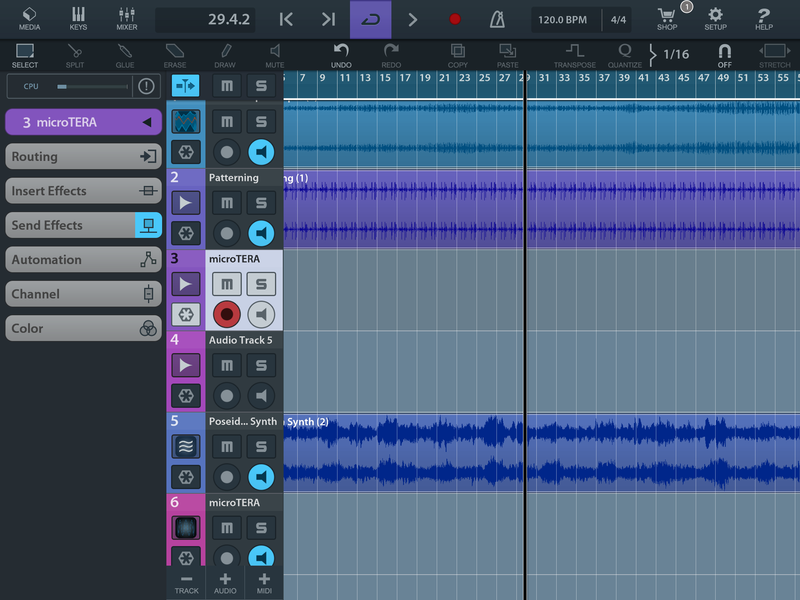 With a large internal phoneme inventory, working with typical vocals, detailed text to speech, time corrected samples powerful excitation generator, and so much more you won’t be short on options to create incredible expressions. Phonem has a powerful matrix system of 19 sources controlling 40 parameters. A little on the small side but very easy to use. 6 envelopes, 4 LFos, 2 X/Y tables and just so much detailed programmability. It’s hard to find anything this can’t do with such a brilliant mod system. 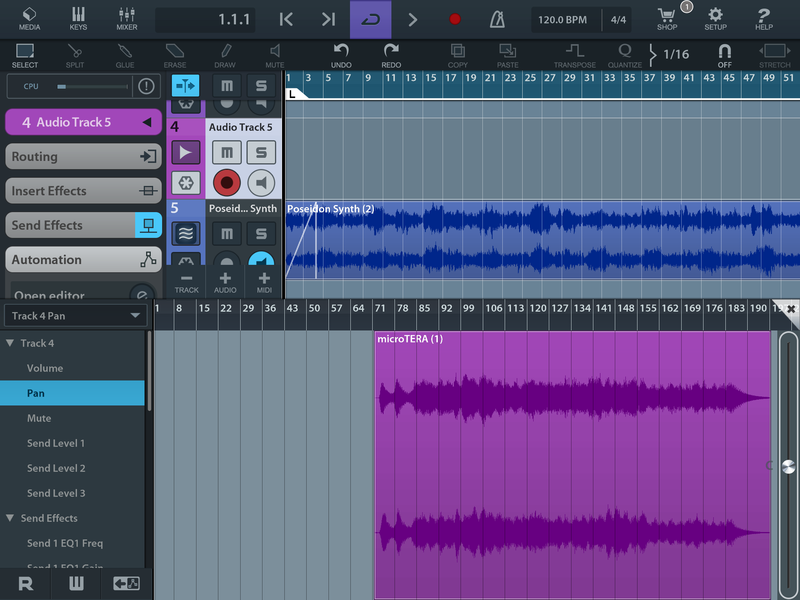 Just when I thought I found a limitation, Phonem proved me wrong. Thanks to the comprehensive help options, and a little reading time I’ve found ways to get any type of sound done. You can also easily import and modify wave tables or time corrected samples from WaveGenerator or WaveMapper. Or, create your own wavetables. Composing your synthesized text is as easy as sliding your finger. 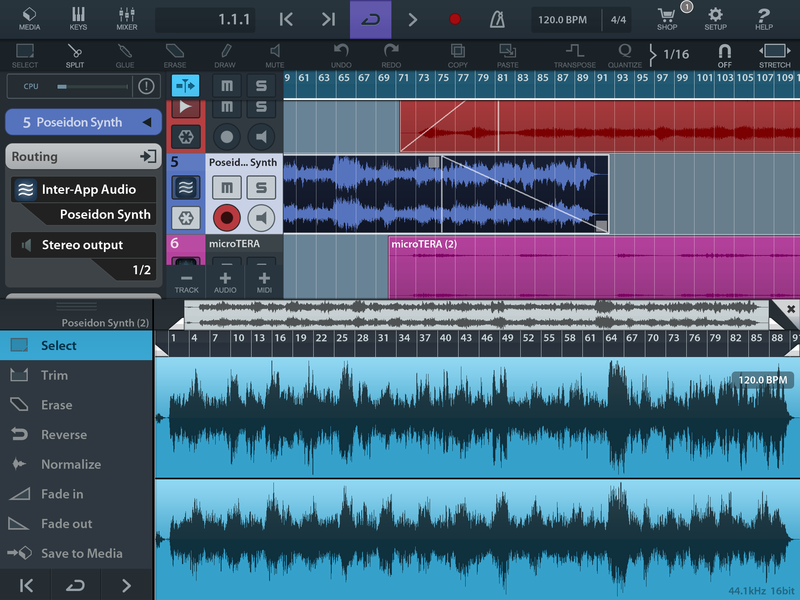 Touch and hold the spot and drag to create the sound you want in amazing detail. Missed something? No problem, it’s easy to fix and just as easy to add more. Change the slope, cut off, length and more. The ability to layer and intensify each source is no sweat. 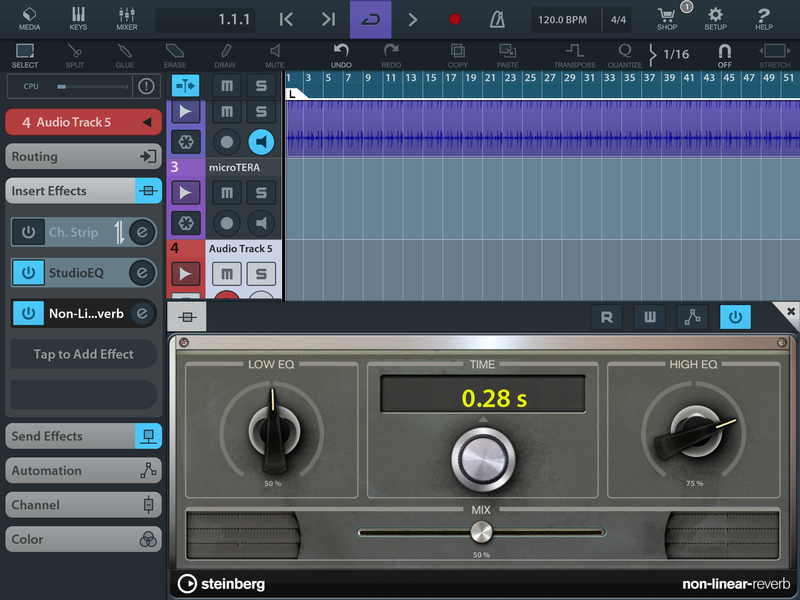 Abrupt or smoothly blended, turn the dials to get the right effect. There’s even specific dialect options among the many options. Thanks to the A/B button comparing edited sounds is simple. Check the Wave and make intricate edits. Pick individual parts of the spectrum or draw the frequencies. Everything is nicely placed on the screen making it so easy to work on certain pieces. Moving among the various modes to work with never gets convoluted. The redesigned browser of sounds can be filtered to very specific patch types. There’s a nice delay and reverb unit built in. 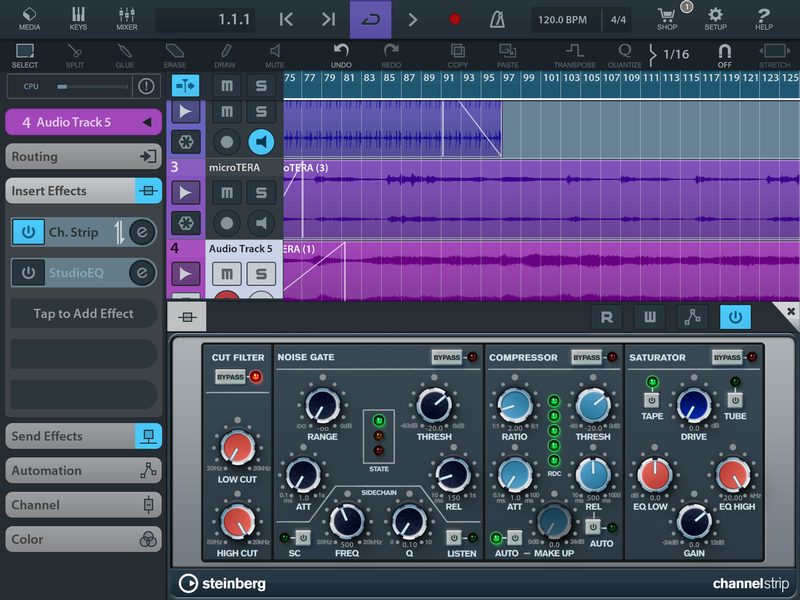 The programmable resonance filter is very well done and can bring flexible degrees of sound effects. If you spend some time with it you’ll find tons of new ways to create unusual FX. All around Phonem is a packed with quality and no detail is anything less than exceptional. 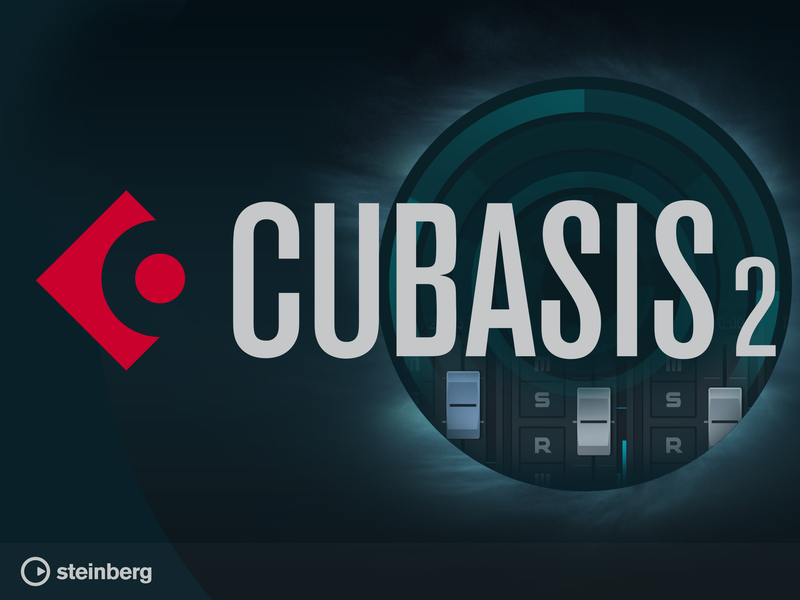 There is no shortage of control which promotes a sound designing suite of massive potential. 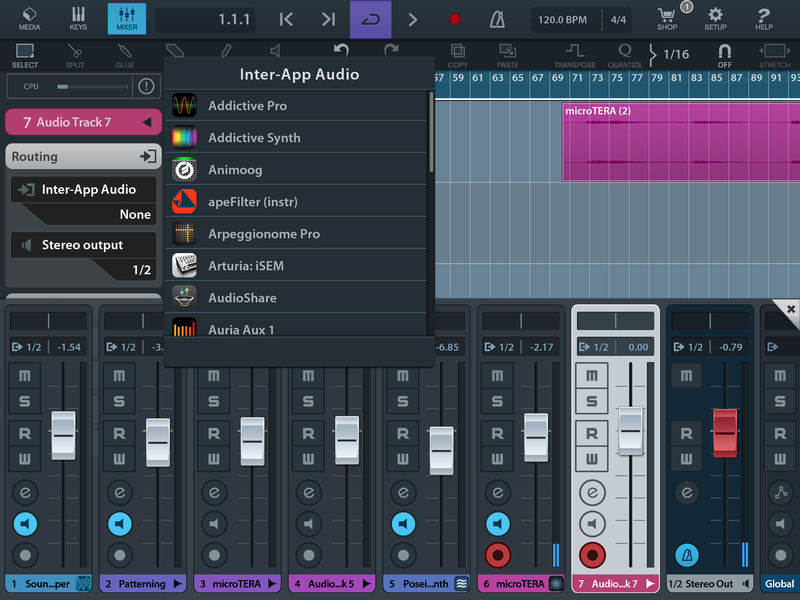 Connecting with Audiobus 2 or Inter-App audio works perfectly. I never lost connection or suffered any crashes. 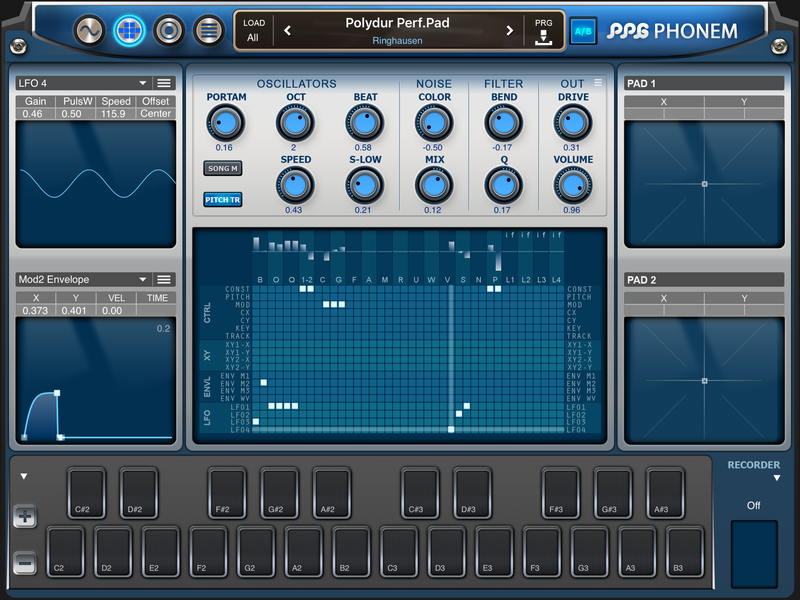 Phonem has been a real joy for me to work with, and I’m still finding more possibilities every time I open it up. Thank you Wolfgang Palm for another truly remarkable effort.